The 477 Human Services Departments Education, Employment, and Training Program is designed to help community members gain training and education to assist with finding jobs related to their skills. EET provides funding to eligible applicants for short-term and technical training, and apprenticeships. Funding is also available for college degrees including Associate, Bachelors, Masters, and Doctoral levels. Scholarships for those seeking an associates, vocational, or bachelors degree are only awarded to enrolled members of the Shoshone-Bannock Tribes. There is no residency requirement, but the applicant must complete an application for services with supporting eligibility documents, and school document found in the Higher Education Scholarship packet. 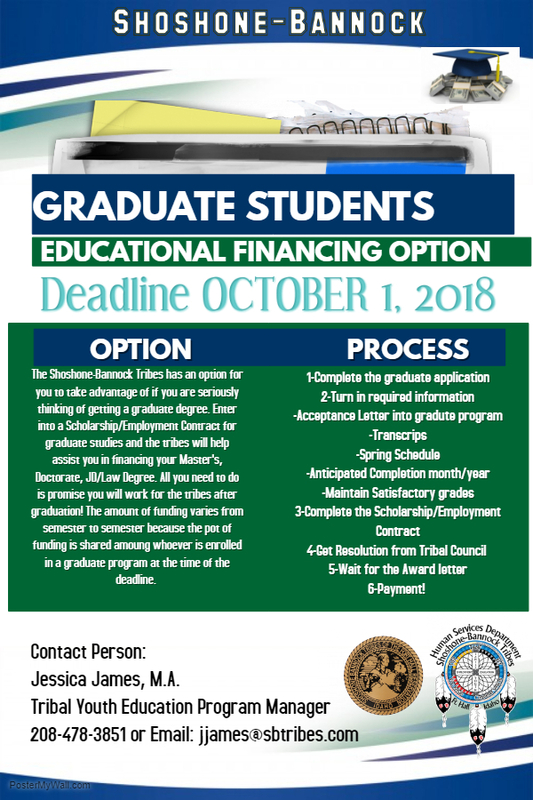 The Shoshone-Bannock Tribes has an option for you to take advantage of if you are seriously thinking of getting a graduate degree. Enter into a Scholarship/Employment Contract for graduate studies and the Tribes will assist you in financing your Master's, Doctorate, JD/Law Degree. All you need to do is promise to work for the tribes after graduation. The amount of the funding varies from semester to semester. Scholarships for those seeking a graduate degree are only awarded to enrolled members of the Shoshone-Bannock Tribes; and there is no residency requirement, but the applicant must complete the Graduate Student Application within the appropriate timeline. Idaho American Indian Fee Program. The vision of the plan states the Idaho State Board of Education (ISBE) and the State Department of Education (SDE) envision all American Indian students thrive, reach their full potential, and have access to educational services and opportunities. This vision is implemented through creating and leveraging educational opportunities in collaboration with Idaho's Tribes, ISBE, SDE, institutions of higher education, and local and regional education partners. The IIEC submitted an American Indian tuition fee proposal to the Board and the result was to pilot an initial program at Idaho State University. The pilot is open to all tribally enrolled members of Idaho's five federally recognized tribes: Coeur d' Alene Tribe, Kootenai Tribe, Nez Perce Tribe, Shoshone-Bannock Tribes, and the Shoshone-Paiute Tribes. This new tuition fee that all eligible students must apply for; it is not automatically granted by ISU. ISU and Tribal staff are currently developing the application process, establishing deadlines and finalizing the details of this new fee. This fee is intended to provide more educational opportunities to our Idaho Tribal students and to promote and increase educational achievements for our Tribal membership. Tribal enrollment status for Idaho college and universities has been extremely low, and in fact, has declined in recent years. Eligible students will pay a $60 per credit fee, in lieu of current tuition, that will be applicable to all technical, academic undergraduate, and graduate programs, effective for the Fall 2018 academic year. All other fees, including special course fees and institutional local fees such as technology, activity fee, facilities, online, and professional fees still apply and are the financial responsibilities of the student. The student must be an enrolled member of one of Idaho’s five federally recognized American Indian tribes that maintains a reservation in Idaho: Coeur d’Alene Tribe, Kootenai Tribe, Nez Perce Tribe, Shoshone-Bannock Tribes, and Shoshone-Paiute Tribes. The student must provide verification of tribal enrollment, such as a Tribal Enrollment Card, from the appropriate tribe to receive the fee waiver. The student must apply for the Free Application for Federal Student Aid (FAFSA) for each academic year the proposed fee is requested. The student must maintain satisfactory academic progress according to institutional requirements. The student must be degree-seeking. The Tribal Education programs will be conducting outreach to Shoshone-Bannock students once the details are final. Please check back frequently to this page for more information, because our goal is to implement it this Fall. In order to do that, we will have deadlines that all eligible students must meet. Contact Education, Employment & Training. We are dedicated to strengthening families and youth through education and employment. We help our tribal members thrive, reach their full potential, and have access to educational services and opportunities.